TODAY: Watch the 2010 Open and World Class Semifinals LIVE online! Only two more chances remain to view your favorite corps on the DCI Fan Network LIVE! Today, Friday, Aug. 13, the World and Open Class World Championship Semifinals will be webcast live from Lucas Oil Stadium in Indianapolis presented by the Woodwind & Brasswind. With 33 of the world's best drum corps scheduled to compete, during the evening World Class edition, you'll also witness a special performance of the Star Alumni Corps, containing members from the legendary Star of Indiana, Brass Theater, Blast!, and other related ensembles. They'll perform a full field production containing selections from each year of competition, from 1985 to 1993. This event is sure to be history in the making, and you won't want to miss it! A $14.95 pay-per-view option will grant one-time access to see all of the performing corps at the Open Class Semifinals while the World Class will be available for $29.95 pay-per-view. 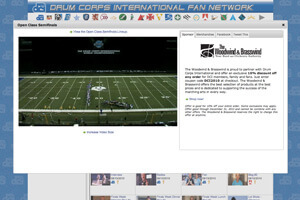 Alternatively, you can buy a Fan Network Plus, Premium SD or Premium HD subscription for complete access to 2010 webcasts, on-demand replays of select DCI Tour events, discounts on downloadable media, and more! View the Open Class Semifinals lineup. View the World Class Semifinals lineup.